Oni Press, Portland’s premier independent comic book publisher, announced today Hopeless Savages: Break, a new chapter in the Hopeless Savages story, by original series creator Jen Van Meter and artist Meredith McClaren (Hinges), featuring art by original series artist Christine Norrie. Hopeless Savages: Break will release on August 12th, 2015. 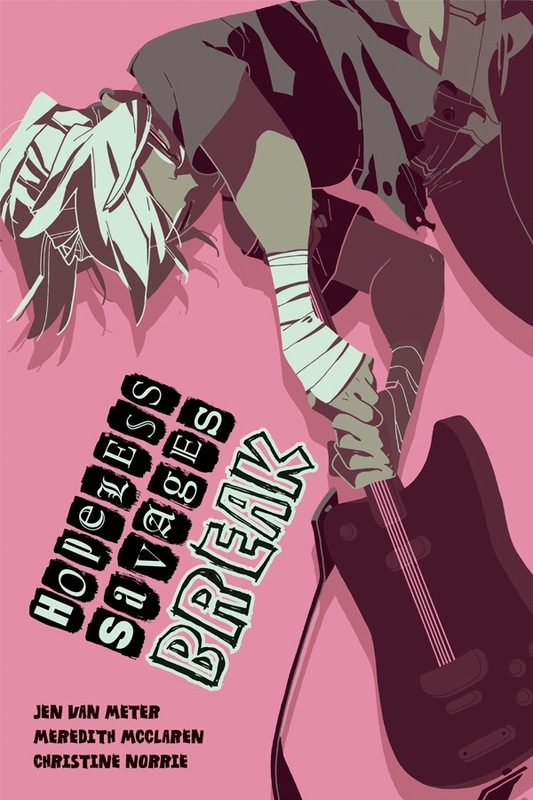 Hopeless Savages: Break continues the story of fan favorite protagonist Zero and her punk rock family. Zero finds herself in college and thoroughly hating it, though an upcoming tour with her band The Dusted Bunnies promises to rejuvenate her spirits. A rival band threatens to end the tour early, and without her family, Zero is in no position to fight back. Meanwhile, the rest of the Hopeless-Savages are dealing with their own problems, including babies, contracts and drug addictions. If there’s one family who can pull it all off, it’s this one. The parents of the Hopless-Savage family were once punk stars and have since settled down to raise a family that while non-conformist, is strong, loyal and loving. Most of the children have since moved away, except for the youngest, Skank Zero, who remains at home and often clashes with her mother over their similar personalities. The first volume sees the Hopeless-Savage children come together after their parents are kidnapped and they have to track down their oldest brother who abandoned his punk roots. Together, they work to return their parents home safely and uncover some embarrassing secrets about their past.